Put your makeup on fix your hair up pretty and meet me tonight in Atlantic City..."
It's not the same scale as the gang-wars of New Jersey, but there is something here. 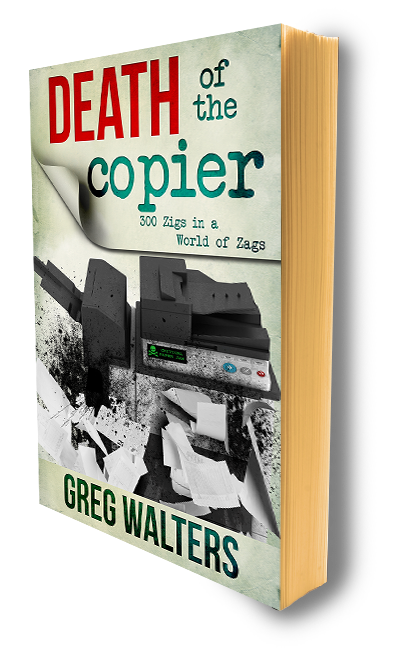 If you've been in this nutty industry for more than five years, you've probably heard tell of the mythic millionaire copier dealer who built a dealership and sold out. He waited in siege around the non-compete, got back in, built up another dealership, sold out once again. Hey, this is America and there is nothing wrong with doing what you do well, and getting paid to do so. Capitalism at its best. I love it. Yet, after talking with a couple of these new/old comers, I walked away feeling the need for a shower. I felt as though I had just been 'pumped' for free information on how to make it in MPS. That's not all bad; I give away free advice all the time. What made these encounters smarmy, each seemed to take what I said, and shove it into their little box - they wanted to hear, what they wanted to hear. Another incident; during Peter Sheehan's breakout session at the 2011 Global MPS Conference, Peter was exploring innovation. One of the person's in attendance blurted out, "...it's easy to be innovative with someone else's money..." tossing a cold, wet towel into the middle of the ring - most ignored him. I didn't. I took note. You see he was correct, from his perspective, from his position in his 'box'. He single handedly rationalized his heartless existence. A millionaire? Yes. Rich? Not sure. So, will they try to implement the same business model that worked before? And, "by getting into MpS" this is to say the old guys want to get into the VAR/MpS space, not the old, copier dealer, CPI, Stage 1&2 arena. Can one really 'rip and replace' servers, blades, switches and UC? And if we build it, will they come? When was the last time HP or CISCO bought one of their VARs? Would an Alco/Ikon-esque, or Global-like collection of independent IT VARs attract the attention of a major technology OEM? Could we (VARs) create our own channel ?